At GCCEM, we are your local mechanical and auto-electrical experts. When it comes to repairing and replacing your alternator, we use the highest quality parts. With a team of industry professionals working on your vehicle, you can feel confident that you’re getting a reliable solution each time at a competitive price. Alternators are a vital component of your vehicle, without it you won’t get very far. If you’re having trouble starting your vehicle or the battery light is on, make sure you ask us to perform one of our free alternator output tests. As a car-owner, it’s pretty important to keep on top of the health of your alternator. The alternator is responsible for supplying electrical power to your vehicle. The battery is the electrical storage device needed to start your engine but once the engine is running it won’t last long on just the battery alone. 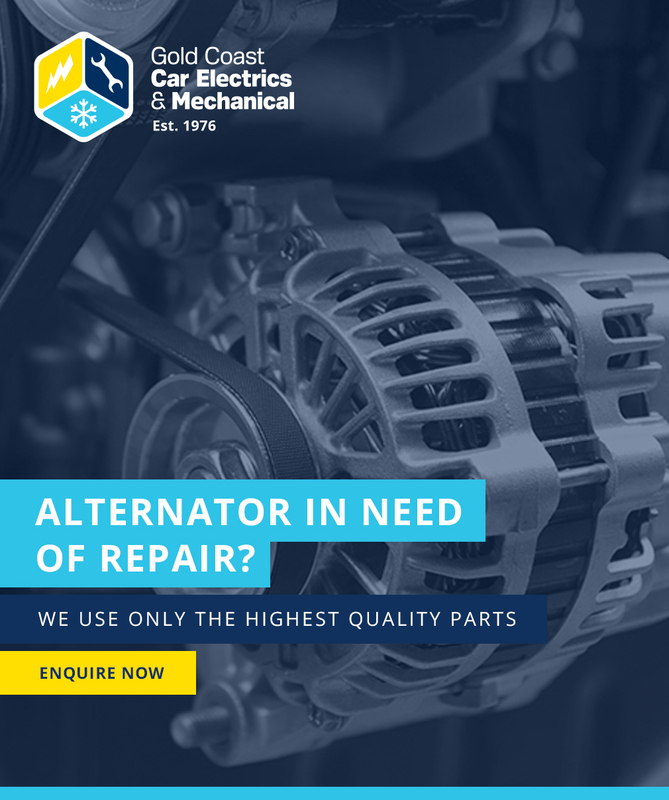 The alternator’s job is to re-charge the battery for your next start and to power vehicle components such as lighting, control units, fans, fuel pump, injectors and much more. Alternators are generally driven by the engine’s fan belt and have a varied output depending on vehicle demands. It can be a stressful time when the alternator on your car needs repairing, but with the team at Gold Coast Car Electrics & Mechanical, you’re in great hands. At GCCEM, we are committed to offering our valued customers top of the range solutions for all their mechanical and auto-electrical needs. We do this by employing a team of highly qualified professionals who know how to produce exceptional results every single time and making sure that our customers leave happy. We specialise in quality, cost-effectiveness and unparalleled customer service to ensure that your experience is seamless every time you visit us. Whether you are seeking effective alternator repairs, a safety certificate or want to maintain your car’s air conditioning system, we are the professionals to call. At GCCEM, we provide a huge range of alternators to suit all vehicle models, whether you need a replacement for your car, truck, bus, equipment or boat! Simply ask us for advice and we can ensure we pair the right alternator to your vehicle. We can supply alternators to suit all budgets including genuine OEM units, aftermarket and remanufactured/reconditioned units. We can get our hands on specific alternators that aren’t that common or modify one slightly different to suit. GCCEM also stocks a wide range of reconditioned alternators that we have reconditioned in house, which might assist for those hard to find units. We also do alternator repairs on the Gold Coast, providing you with all of your available options as well as our professional advice so you can proceed in the most cost-effective manner. We also offer LPG servicing and repairs, car battery services, air conditioning services and our handy mobile auto-electrical and mechanical service. At GCCEM, we understand that your car is one of your most prized possessions, and when our experts service it they’ll treat it as such. If you’d like to ask us any questions about our alternator repairs on the Gold Coast, or if you’d like to book in for an appointment you can give us a call on (07) 5597 4774. In the meantime, scroll down for a handy list of our most common questions and answers – they might help you with any questions you might have. Can my alternator be repaired? Yes, in many cases we can repair the alternator by installing new parts to it, but we will advise you to whether it’s more economical for you to fix or replace your alternator. In these times, with the quality units available through us that come with long warranty periods, it may just be better long term to replace the unit. How can I tell if there’s a problem with my alternator? One of the first signs there might be a problem with your alternator is if a warning light comes on. Often this will be a battery symbol, but it doesn’t necessarily mean there is a battery problem. If your battery keeps going flat, the alternator is making unusual noises or if it’s just not keeping up electrically bring either your unit or vehicle to us and we can check it out. What are some common alternator faults? The most common problems to arise with a faulty alternator are worn carbon brushes, worn sliprings, bearings or a faulty rectifier.